Born in Niš, Serbia, on 20 November 1979, Bojana Popović started playing handball at the age of 11. In her late teens, she made her former Yugoslav league debut with DIN from Niš, a club she played for the first two seasons of her career. In 1998 she moved to Budućnost, and stayed in Podgorica for four years and won four consecutive Yugoslav League titles and three national cups from 1999 to 2002. She was noticed by Danish powerhouse Slagelse, at that time coached by Anja Andersen. 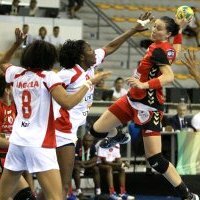 Well aware of the strength of the Danish league and Denmark’s top status among women’s handball nations, she did not hesitate to move. And with Slagelse she experienced great success: three times EHF Women's Champions League winner (2004, 2005, 2007), EHF Cup winner (2003), three Danish Championship titles (2003, 2005, 2007) and one Danish Cup trophy (2003). While playing for Slagelse, Popović was voted Player of the Year in Denmark in 2004, 2005 and 2007, mainly for her contributions to EHF Champions League victories by Slagelse in those years. She also finished as the Champions League’s top scorer in 2004 (98 goals), 2005 (85 goals) and 2007 (96 goals), and Danish League’s top scorer in 2004 (219 goals) and 2005 (222 goals). In 2007 she changed sides, staying in Denmark but now playing for Viborg. Playing for Viborg, Bojana Popović continued her winning streak. She won another three Danish Championship titles (2008, 2009, 2010), two Danish Cup trophies (2007, 2008) and two more EHF Women's Champions League (2009, 2010). Also, she was voted Player of the Year in Denmark in 2008. On 20 February 2008 Bojana Popović suffered a serious knee injury in Vienna. Early in the second half of EHF Women's Champions League game against Hypo, after shooting on goal and scoring from a clear chance, the Montenegrin twisted her knee. Scans proved that the front ligament of her knee has been torn completely. This, together with other damage to her knee, meant Popović was sidelined for a long time, and her top-level career was even in doubt for a time. But after almost eight months, precisely 232 days after she hurt her knee, uncrowned queen of world women’s handball returned to action on 10 October 2009, at the beginning of Danish League. “During the recovery period I tried to use my time in the best possible way, to regain my physical and mental strength, and come out of it even stronger than I was before. I think I achieved that,” said Bojana after she came back on the court. And she was right. She came back stronger than ever, as she proved it by finishing third highest scorer in the EHF Women's Champions League (with 84 goals), won by her team, Viborg. In the summer of 2010 she decided to come back to Budućnost, and proved once again that the decision was good. In the first year, in season 2010/2011, she led Budućnost to the EHF Women's Champions League semi finals, where Larvik proved too strong. Popović finished third on the Top scorer’s list with 85 goals. She finished the season with both Montenegrin Championship and Cup titles, and also with the trophy in Regional League. But her But her The last season was icing on the cake. Besides winning the same trophies as the season before (Montenegrin Championship and Cup titles, and Regional League trophy), Bojana and Budućnost finally managed to achieve the long-standing dream of the club – to win the EHF Women's Champions League trophy. Bojana finished second in the scorer’s list with 106 goals. Playing for the former Yugoslavia, Popović won a bronze medal at the 2001 World Championships in Italy. After the independence of Montenegro in May 2006, Popović decided to play for them since her husband Petar Popović is Montenegrin, a former basketball player. So far, she has collected 46 caps for Montenegro and scored 256 goals. Bojana Popović played the whole career with the same number – 17. Now, she has one last dream - to play the Olympic games in London.